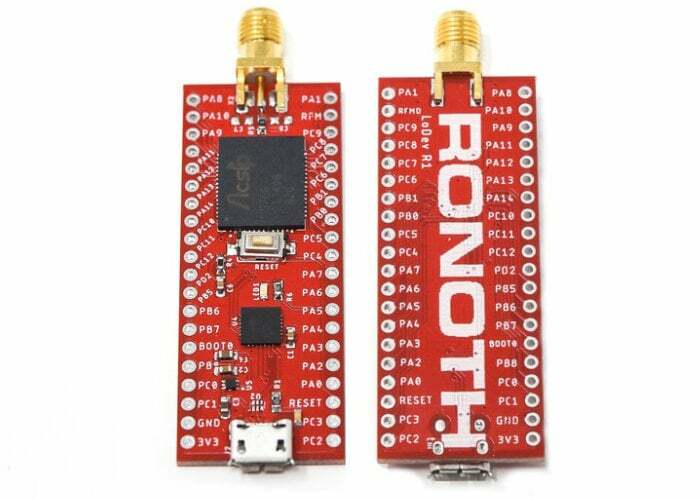 The development team at Ronoth has created a new development platform in the form of LoDev, which takes the form of an open source LoRa development board featuring the S76S SiP (system-in-a-package) from AcSip. Created to enable Internet of Things developers, hobbyists and engineers to easily create sensors and devices with long-range connectivity. The S76S is a compact SiP featuring STM32L073 micro-controller, SX1276 LoRa Radio, and RF matching components, all in a very compact 11×13 mm package that comes with an FCC modular certification. Watch the video below to learn more about the Internet of Things development platform offering wireless technology that can be used for a wide variety of different applications both by hobbyists and industrial developers. – Fast GTM (Go to Market) – Using the LoDev platform along with the wealth of code and examples available through the Mbed community it’s possible to develop custom sensor applications in days not months. When it’s time to go from LoDev to a custom board layout using the S76S . You’ll also have the peace of mind knowing the S76S is FCC modular certified saving you time and money navigating RF regulations. – Design flexibility – The S76S is the smallest self-contained LoRa® SiP on the market. Save that board space for a bigger battery. For more details jump over to the Crowd Supply website by following the link below.